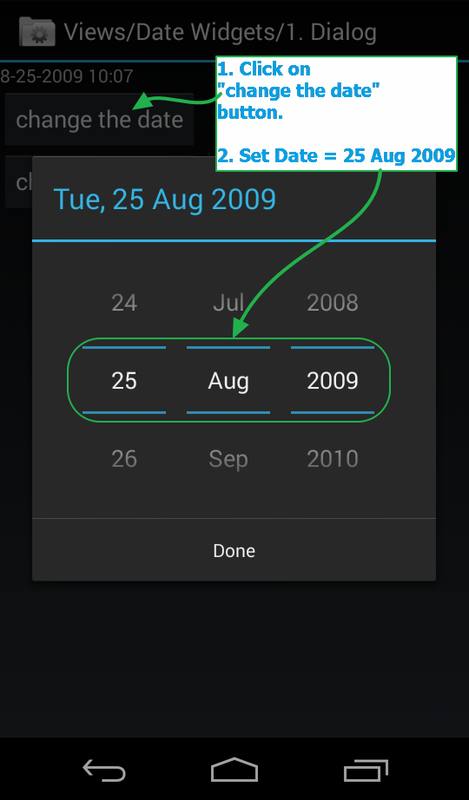 Android software apps contains date pickers. Date picker can be Inline or It can be In dialog. Just like other elements of android app software, We can automate android app's date dialog to set date and time dialog to set time In android appium software automation test. Here I have demonstrated simple example on how to set android app date and time In appium test. 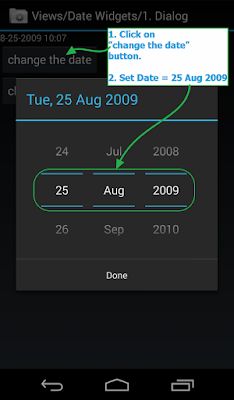 For your android app's date picker, Date format can be different but method to set It will remain same as described bellow. We will use same API Demos app to demonstrate how to set date and time In android appium software automation test. Download API Demos android software app from THIS PAGE. We wants to set date = 25 Aug 2009 In date dialog and time = 1:25 pm In time dialog as shown In bellow Images. Manually you can navigate to above screen from API Demos app -> Tap on Views -> Tap on Date Widgets -> Tap on 1. Dialog. Create new SetDate.java file under Android package of your project to test android software app and copy paste bellow given test script In It. // Scroll till element which contains "Views" text. // Scroll till element which contains "Date Widgets" text. // Click on element which contains "Date Widgets" text. // Scroll till element which contains "1. Dialog" text. // Click on element which contains "1. Dialog" text. // Click on button which contains "change the date" text. // Click on button which contains "change the time" text. As you can see In above test, We have created two @Test methods. Then It will click on change the date button. It will open set date dialog. Next 3 driver.findElement() method will locate date, month and year textbox and set requested date, month and year In related field. Then It will click on Done button to close date dialog. It will click on change the time button. It will open set time dialog. Next 3 driver.findElement() method will locate hour, minute and am or pm textbox and set requested hour, minute and am or pm In related field. 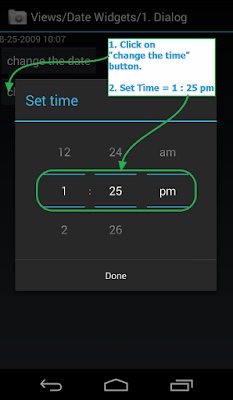 This Is the way to set date and time in date and time dialog of android appium software automation test. Hi, is this going to work on all devcies? I mean Nexus, Moto, Samsung and other. Hi Aarvind, I tried this code on Motog, Nexus 5X, S4 and it could open the calendar, but not the calendar view like your blog has. Also, when i tried to manually choose date by the displayed calendar I couldn't change the date of device. Can you help further with same? If calender view is different then may be you need to change code. What is the method to open the date settings from the android phone? Eagerly waiting for next series of Tutorials. how to scroll the calender.. picking the Single date is working i need to scroll the date automatically.